If you want to win in Kentucky, you’ve got to have the horses. That goes for teams at the NCAA Division I Cross Country Championships as much as it does for trainers at Churchill Downs. Trainers, however, only need one finely-tuned specimen to gain Kentucky Derby immortality. Championship teams – like New Mexico, Northern Arizona and Syracuse – must have a few more. The Lady Lobos, Lumberjacks and Orange were the last three teams to win NCAA DI titles at E.P. “Tom” Sawyer Park and had 18 All-Americans between them. New Mexico and Syracuse captured those crowns in 2015, while the former and NAU earned the top podium spot this past weekend. Back in 2015, the Lady Lobos and Orange put together stalwart performances. New Mexico had five runners in the top-25 and tallied just 49 points – the lowest team score by any women’s team since 1982. Courtney Frerichs and Alice Wright led the way in fourth and fifth. Syracuse put three of its runners in the top-10 – Justyn Knight (fourth), Colin Bennie (eighth) and Martin Hehir (ninth) – and saw another earn All-America status as well (Philo Germano, 39th). That top-end depth held off Colorado’s five All-Americans and gave the Orange its first team title since 1951. Fast forward two years and the Lady Lobos returned to the mountaintop. Behind Ednah Kurgat’s record-breaking effort, New Mexico won its second national title in the past three years. Kurgat set a championship record for a 6K course with her time of 19:19.5 and the Lady Lobos flanked her with three other All-Americans (Weini Kelati, Charlotte Prouse and Alice Wright). New Mexico won by 15 points over San Francisco. Then we have the Lumberjacks, who wielded chainsaws – not axes – this past weekend. NAU one-upped New Mexico and nabbed five All-America medals. The Lumberjacks put three in the top-10 – Matthew Baxter and Tyler Day mixed it up at the front of the pack in second and third, respectively – and won by 53 points, the largest margin of victory by a men’s team since 2012 (Oklahoma State). When asked about race strategy after winning their second national title in as many years, Day relayed a message head coach Michael Smith told them before the meet. This wasn’t the first time NAU implemented that strategy this year. There is a reason why the Lumberjacks were the consensus No. 1 in the National Coaches’ Poll throughout the season. 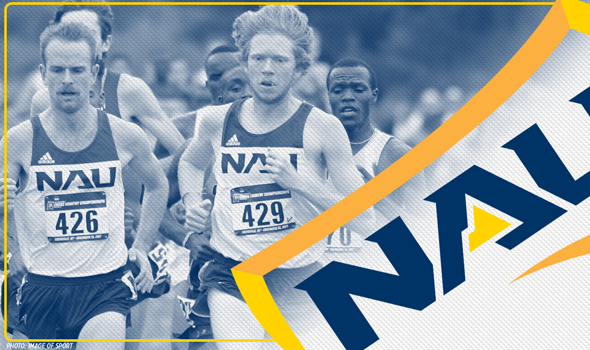 Almost two months earlier, NAU crushed the field at the Louisville Classic. Baxter and Day led the charge once again, but they had two other teammates right behind them in Andy Trouard and Gordon Beamish for the 1-2-3-4 finish. Luis Grijalva crossed the finish line 11th (10th in the NCAA DI standings) to complete the shellacking. Then the Lumberjacks turned their attention to the Nuttycombe Wisconsin Invitational and put three in the top-5 (Trouard, Day and Baxter) to rout 19 other ranked teams. NAU tallied just 50 points, the fewest since Indiana won the team title with 43 in 2010. Based on how strong they were this season and the talent they have returning in 2018 – four of its top-5 scorers at NCAAs – it’s hard to doubt Trouard’s words.